Its Tuesday! So today I bring you another painting guide. This time, its the Galagaak, Raging Tarvox model from Meirce Miniatures which I shall be using for my Ghorgon. 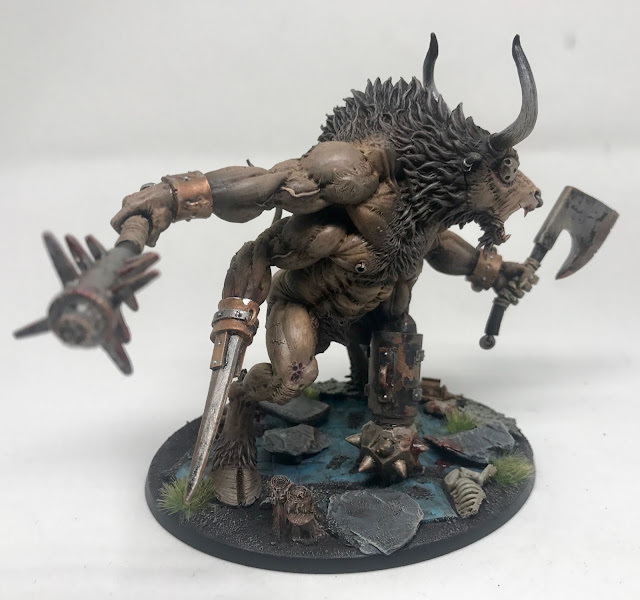 An incredible resin model, here is how i paint him. Being a big block of Resin, I used Superglue and Activator (Mitrefast) to stick it together, there were a few gaps but easily filled with Liquid Green Stuff. I undercoated it Corax White and the base coated it using Camouflage Matt Brown (Halfords Spray), from here I got my airbrush out and begun the transitions of browns and flesh colours on the skin. I started with Beasty Brown from Vallejo Game Air, I sprayed the majority of the model leaving the deepest recesses. The next colour was Barbarian Flesh from Vallejo Game Air, I sprayed the top half of the model and side of the skin, leaving the undersides still Beasty Brown, I also used this colour for the hoofs. The final step was to start mixing in Skin tone from Vallejo Model Air, there was 4 steps to this, 75:25 Barbarian to Skin tone, 50:50 same colours, 25:75 and finally a tiny bit of just Skin tone. I worked the angles on each step gradually till the second to last layer was from 90 degrees. The final highlight of just Skin tone was focused on just parts I wanted to pop a little more. 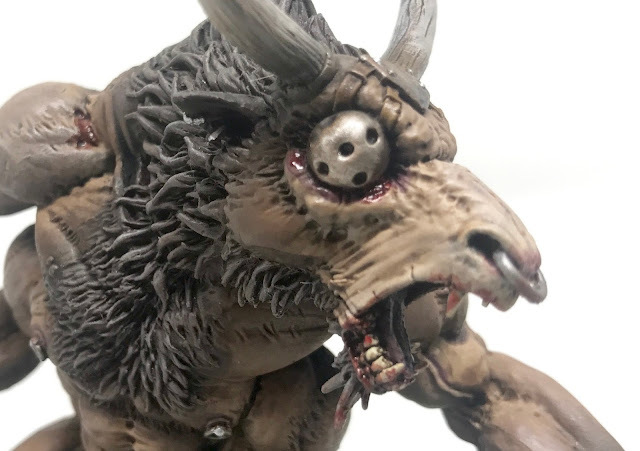 I used Ushabti Bone to paint the teeth and claws, the hair was painted with Rhinox Hide and highlighted with Ushabti Bone., the grips on the weapons were painted with Rakarth Flesh. The tongue was painted Rakarth too and shaded with Carroburg Crimson. 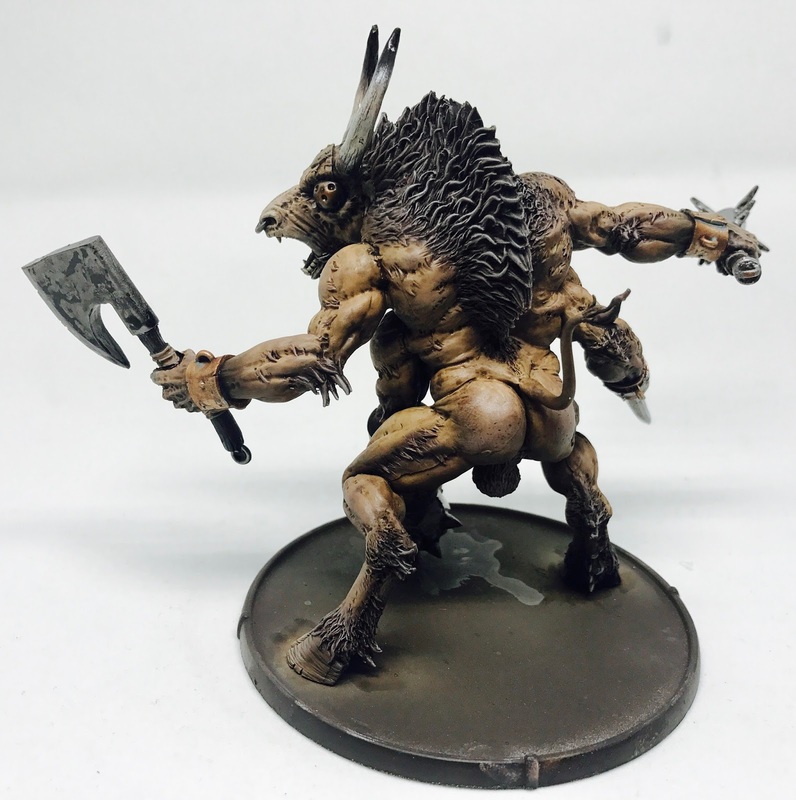 The model was washed with Agrax Earthshade and the veins had a layer of Skin Tone. The horns then had a quick airbrush of Black on the tips and was coated using 'ardcoat. 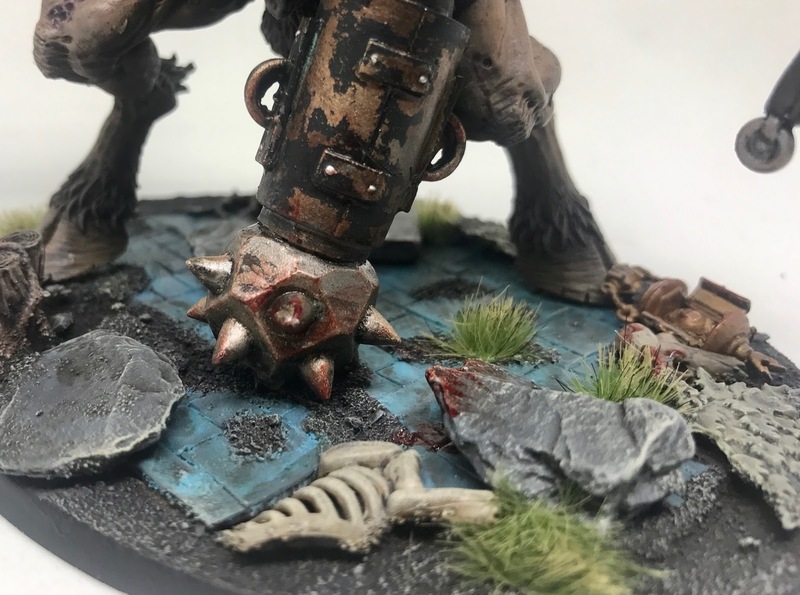 Onto the metals, I wanted to create a really worn out look, chipped paint and rust. I base coated the wrist straps and front weapon casing in Balthasar gold, these parts were washed with Agrax, drybrushed with Balthasar once again and some Nilikah Oxide was applied. 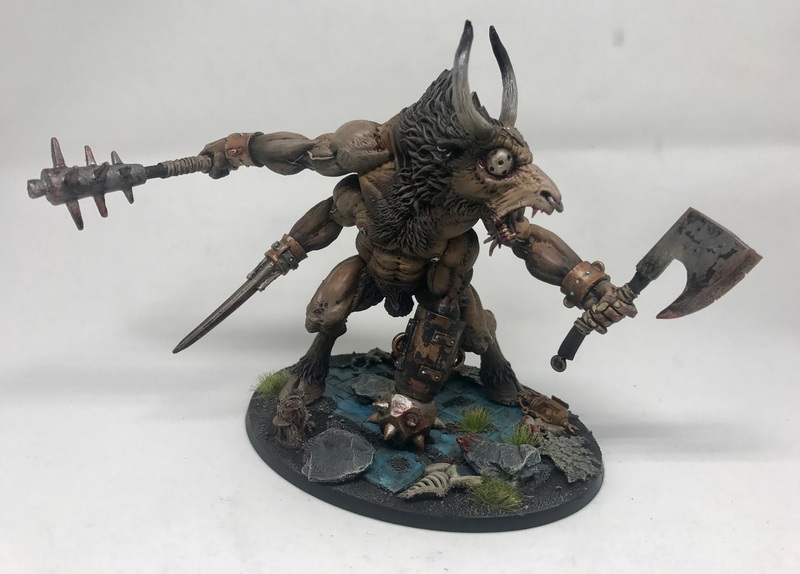 The silver of the weapons themselves were drybrushed with Ryza rust, Gorthor Brown and Typhus Corrosion. The whole of the metallic areas were given a coat of Chipping medium by Vallejo, I then went and painted the leadbelcher on the weapons for the silvers and the Gold was painted fully with Abaddon Black. I then got an old dry brush once this was dried and dipped it in water and scrubbed, this removes the layers above the chipping medium, but crucially not all. It gives it a natural chipped look! I sealed this all with Matt Varnish and followed it up with a shade of Nuln Oil Gloss on the Silvers. Finally I drybrushed these areas again with Ryza Rust and Stornhost Silver and picked out all the rivets with Stormhost too. 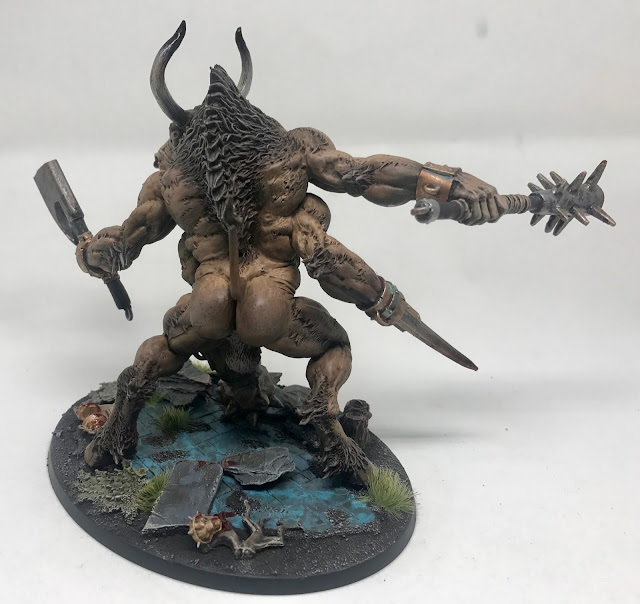 Once the model was based in my Brayherd scheme and Blood for the Blood God was added it was done! 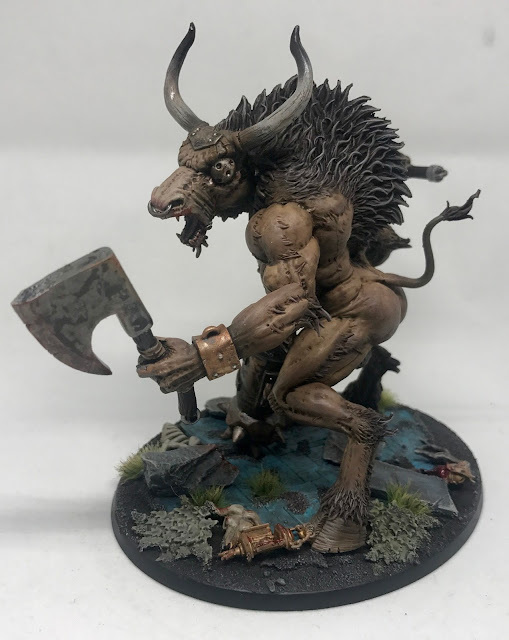 I tried many new techniques on this model with skin highlights and chipping and i am overall really happy with how he turned out. Below are some more angles of the model. Let me know what you think. Awesome paintjob! 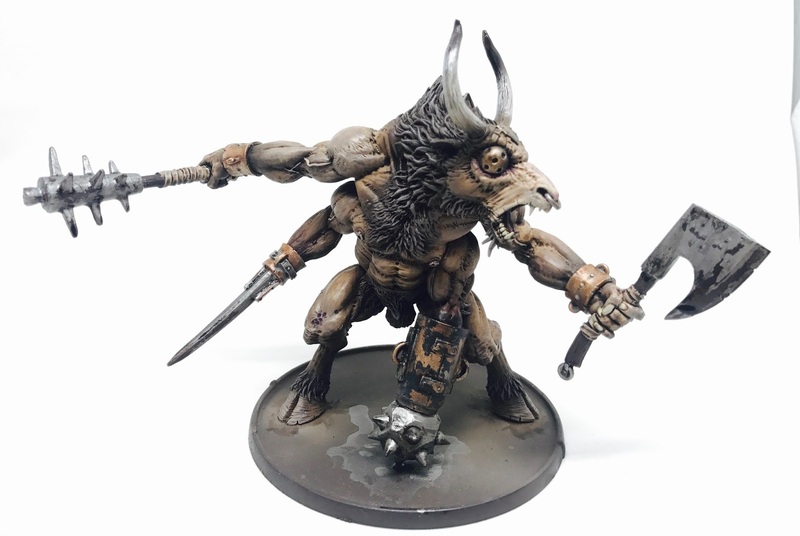 Is this model similar in height to the GW Ghorgon or shorter like the Khorne Demon Prince or another figure?